Today was the 154th anniversary of two great speeches given at the dedication of the Gettysburg Soldiers National Cemetery. Many of us can quote parts or even the whole of one of the speeches. The other speech is rarely remembered and very few people even know anything about it. Of course the speech that is remembered is a short one given by our President Abraham Lincoln. How many of you had to memorized the first sentence of this speech? Can you continue the words after “Fourscore and seven years ago ………? 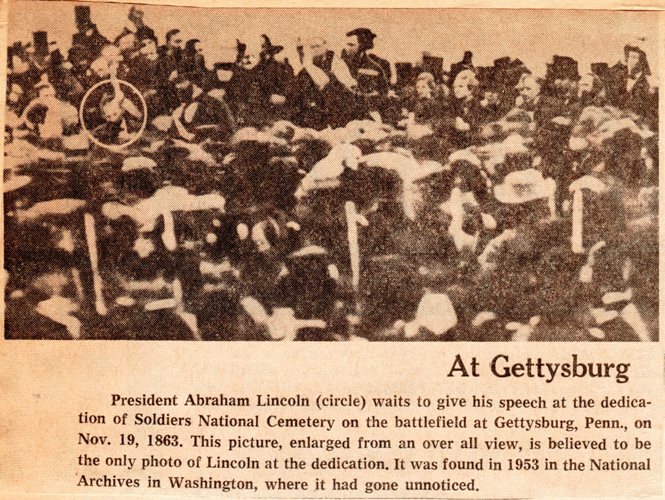 Here is the complete text of The Gettysburg Address. Tonight I pasted them from a previous post that I wrote, but when I wrote the post four years ago I typed them out so that I could get a better feel for them. Before I continue the post, I will take the time to read what I just pasted. Fourscore and seven years ago our fathers brought forth on this continent a new nation conceived in liberty and dedicated to the proposition that all men are created equal. Now we are engaged in a great civil war testing whether that nation, or any nation so conceived and so dedicated, can long endure. We are met on a great battlefield of that war. We have come to dedicate a portion of that field as a final resting-place for those who here gave their lives that that nation might live. It is altogether fitting and proper that we should do this. But, in a larger sense, we cannot dedicate, we cannot consecrate, we cannot hallow this ground. The brave men living and dead, who struggled here have consecrated it far above our poor power to add or detract. The world will little note nor long remember what we say here, but it can never forget what they did here. It is for us the living rather to be dedicated here to the unfinished work which they who fought here have thus far so nobly advanced. It is rather for us to be here dedicated to the great task remaining before us — that from these honoured dead we take increased devotion to that cause for which they gave the last full measure of devotion — that we here highly resolve that these dead shall not have died in vain, that this nation under God shall have a new birth of freedom, and that government of the people, by the people, for the people, shall not perish from the earth. One thought stands out to me as I reread it. Standing beneath this serene sky, overlooking these broad fields now reposing from the labors of the waning year, the mighty Alleghenies dimly towering before us, the graves of our brethren beneath our feet, it is with hesitation that I raise my poor voice to break the eloquent silence of God and Nature. But the duty to which you have called me must be performed; —-grant me, I pray , your indulgence and sympathy. It is not that what Everett spoke during his oration was not memorable, it is rather that what he said was overshadowed by the following short address by the President. I really like the words above with which he started his oration. The weary masses of the people are yearning to see the dear old flag again floating upon their capitols, and they sigh for the return of the peace, prosperity, and happiness, which they enjoyed under a government whose power was felt only in its blessings. 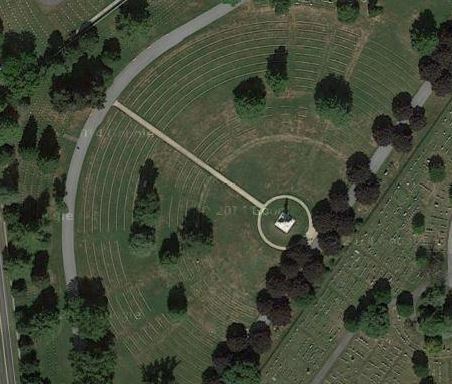 And now, friends, fellow citizens of Gettysburg and Pennsylvania, and you from remoter States, let me again, as we part, invoke your benediction on these honored graves. 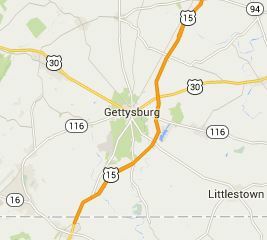 Gettysburg is only about 70 miles from Washington, D.C. and along a train line. The dedication was attended by approximately 15,000 people and included dignitaries from many different states. The governors of Pennsylvania, Maryland, New York, New Jersey, Indiana and Ohio were all present. There is much to tell about the event which has been studied by scholars for many years. However, what will always be remembered is the short two minute speech by President Lincoln. Did you recite the Gettysburg Address today? 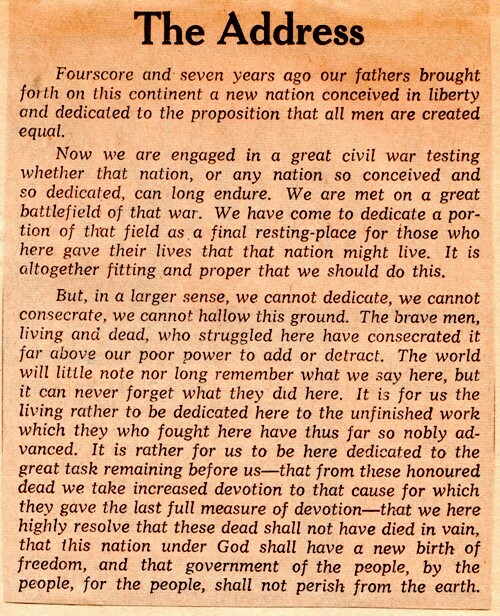 This entry was posted in Culture, Education, History, Memories and tagged Edward Everett, Four Score and Seven, Gettysburg, Gettysburg Address, Gettysburg Oration, President Lincoln. Bookmark the permalink.